THE Home for Lost Dogs, near Battersea Park, is a veritable haven of rest for the "lost and strayed.” It was started in the most unpretentious way, some thirty years ago, in a back kitchen at Islington ; to-day its premises possess ample accommodation for the temporary lodgings of over 20,000 wan¬derers every year ; indeed, during 1890, no fewer than 21,593 passed through its gates (homes being found for 3,388), 1,771 were restored to their owners, and 1,617 new homes were provided where satisfactory safeguards were assured. Such are the interesting canine statistics given to us as we start on our tour of inspection, under the guidance of Mr. Matthias Colam, the secretary. We have entered the great red gates, and stand for a moment upon the threshold of the Receiving House, for a van passes almost at our elbow. Its appearance sug¬gests “ police ” ; at any rate, the driver is an indisputable representative of law and order in mufti. Those familiar cries betray who the inmates are — all sorts and conditions of dogs picked up by the police ; this is a deposit of some thirty lost animals about to find apartments for a time. When the muzzling order was first put into force, such a van would have to run over to Battersea three and four times a day, and then leave a load of the lost behind. The conveyance is specially constructed for this purpose. Our friendly “ policeman in plain clothes” opens the back door, and there one can see that the interior of the van is made into a tenement of two floors, the bigger dogs being placed below, and the more diminu¬tive species above. Iron rings are arranged round the sides, to which the animals are attached by their chains. A small but im¬portant apartment, however, is that place at the bottom of the van, between the two back wheels. It takes the form of a cage, with iron bars and a grating of fine wire. This is designed for the accommodation of a more than usually troublesome dog, some¬times one that is mad, so that he is carried from the police-station to the “ Home ” without upsetting the quieter-disposed dispositions of his fellow-animals above. Of course some dogs are brought here by kind-hearted individuals other than the police, and as many as 500 from all sources have been received in the course of a day. It is impossible to single out one part of London more famous for its “lost ” than another — they arrive from the East and from the West. That delightful little King Charles which is just now cuddled up in a corner of the Receiving House has probably strayed from its custo¬mary luxuriousness of a drawing-room in Belgravia — it will surely be claimed in a few hours — whilst its next-door neighbour is a bull-dog, with a prodigious head, which strongly suggests pugilism and Whitechapel. The Receiving House is situated on your imme¬diate right. It is the first room into which the lost dog goes when it claims admission to the home. A dozen dogs are waiting to be examined — collies, fox terriers, and two or three nondescripts in addition to the tiny King Charles and massive bull-dog already caught sight of. On a beam above, which stretches from one side of the apartment to the- other, are hang¬ing the chains and collars of the animals admitted during the past week, under their proper divisions ox Monday, Tuesday, Wednesday, and so on. This little col¬lection of a dozen are taken in hand one by one. Should any of them be suffering from rabies, they are at once sent to the “Condemned Cell," to which we shall presently pay a visit. The hon. veter¬inary surgeon, A. J. Sewell, Esq., is sent for, and if he endorses the opinion of the receiver — himself a man who “ knows a dog " — the animal is at once destroyed. Some poor creatures pass a day or two in the Infirmary, and are quickly mended under kind and humane treatment, whilst those dogs who have had their day, and are past all aid, are destroyed. This Receiving House has been accorded Royal patronage, for amongst what might be called the canine sweepings of London who have found their way here, the Duchess of Teck's dog has looked in ; so has the Marquis of Hartington's,and Lord Brassey’s. Amongst the rarest of the wanderers located here have been a couple of African sand dogs, little creatures without a vestige of hair on their bodies, saving a relieving tuft on the head. Even at the Dogs' Home many a romance might be found. Think of a poor lost creature being picked up for a few shillings — for dogs may be purchased after a certain lapse of time — and then running away with its new owner and winning an important prize at the Brighton show ! More startling still was the case of a bloodhound sold to Mr. Mark Beaufoy, M.P., for a small sum. That dog, once numbered amongst the lost, was destined to become the mother of the champion blood¬hound of the world — “ Crom-well." Dogs have been sold over and over again and have re-turned. One little story which we hear as we pass into the main yard is worth repeating. “Bluebeard” was his name, and he was a lively boarhound. All that is known of his early life is that he was found walking about, without visible means of subsistence, in the vicinity of Wandsworth. He was lost — hence, away with him to Battersea. On four separate occasions “Bluebeard'* was restored, and every time he found his way back. One night, after the gates were closed, the keeper heard a tap-tap-tap at the entrance. It was the paw of a dog, and when the keeper opened the door it was none other than our old friend “Bluebeard" who had delivered himself up again for the third time. When he crept in he went straight to his former kennel. Eventually, “ Bluebeard " was despatched to the country, where, according to the latest reports, he is doing well. We are now on our way to the kennels — fine, light, airy, and well-built places. We pause just a moment, however, in the play¬ground ; for all the bigger kennels have a play-ground in the rear, where the dogs are let out to enjoy a merry gambol, or indulge in the luxury of a shower-bath, where at one end of the ground a fountain is playing, under the refreshing sprays of which the dogs delight to run. Wooden boxes are provided under which the animals may go in the summer months, when the sun proves too warm for them, or shelter from the rain during an occasional shower or inclement weather. This particular play-ground is inhabited principally by large dogs — retrievers, scotch collies, greyhounds, and even what are generally known as carriage-dogs. We invite them to the sides of the play¬ground — round which substantial iron bars run — and what a noise is there ! Yet we are assured that at night not a sound is to be heard —the sudden shriek of the whistle of a passing train over the bridge close at hand, or the warning note of a steam tug on the river never disturbs them. Dogs in company seem to ensure contentment. You may peep into half a dozen other playgrounds, where the creatures will be found to be more of a diminutive type — hundreds of fox-terriers ; indeed, it would seem that the lost terriers number ten times more than any of the other species, whilst retrievers and collies vie with each other for next place on the roll. And round these im¬mense open cages good people wander with distressful countenances in search of those who have left their kennels in the back garden without notice, or wagged their tails for freedom by forsaking the comforts of the hearth-rug in the front parlour. Suddenly a visitor recognises and is recognised. “ Jack, Jack ! " the owner cries. Jack jumps up in mad delight, barks and barks again, makes a frantic effort to pull down the iron bars in its joy, but all to no avail. Then a keeper enters the playground, picks Jack up in his arms, and surely never was a happier recognition. It is really this that those in authority at Battersea depend upon more than anything else, so as to ensure the lost animal being returned, to its rightful owner. As a rule, the person losing a dog goes into the yard accompanied by a keeper. He picks out a dog, and it is fastened near the gates, where it can be seen from the office. The owner is invited to this part of the yard, and the keeper watches now the dog and its master meet one another again. This simple plan seldom fails. Furthermore, a set of questions have to be answered by the claimant, and mistakes seldom occur. It is whilst we are watching the dogs at play, just as Jack — lost no longer — is tripping away merrily over the stones of the yard, that we arc entertained with numerous anecdotes by our genial guide. We hear of a devoted owner of a little pet terrier. Hers was but an instance of many who come several miles in search of their favourites. This lady travelled some six or seven miles every day for a week in the hopes of having this same little terrier returned to her. It was last day of the week, and there was the affectionate owner scanning eagerly every dog that entered. At last the rumble of the wheels of the police van was heard, and when the door was opened, there amongst the other inmates lay a tiny creature in the corner fast asleep. “ That's Dot ! my little Dot ! ” cried the lady, and at the sound of her voice the wandering terrier jumped up, and seemed as though it would go mad ere one of the assistants could loosen its chain. Dot went away again with its mistress. It is needless to say—to put it kindly — that wrongful appropriators of dogs occasionally pay a visit to Battersea, and a capital story is told of one of these gentry who had seen a kind-hearted policeman taking in a lost pug that same morning. Our friend from Whitechapel did, evi¬dently much pleased with his tactics. In a few moments he was invited to step into the vard, where some four or five pugs were held in check by a keeper. “ Which is yours ?” was asked. When this enterprising gentleman was told that the dog he had chosen had been in the home a fortnight, and, further, that the collar and ribbon had been taken off the real dog's neck and temporarily deco¬rated the throat of another animal, Whitechapel was somewhat abashed, and was glad to get away. 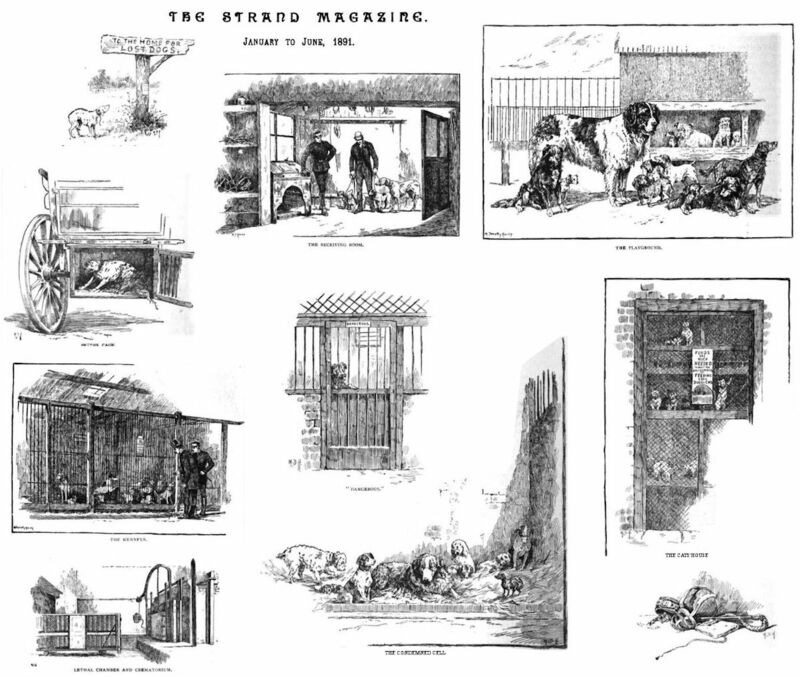 The principal kennels are in the centre of the yard, and are divided into compart¬ments denoting the various days on which the dog entered, so that at the completion of the period which the law requires all dogs should be kept, the animal will have been a temporary tenant of all of them in rotation. The two sexes are separated immediately they enter, and you may walk down the centre avenue enjoying the frolics of the mer¬riest of fox-terriers in one cage, and stay to admire the fine coat of a lost St. Ber¬nard, or pat a good-looking collie on the back as they look almost pitifully towards you. This little army of dogs eat some two tons of biscuits and meal in a fortnight. At six o'clock, when the place is closed, the dogs are bedded down with plenty of clean straw and a liberal supply of sawdust, and every hour a night watch¬man goes his rounds to see that there is no fighting, and to attend to the Crematorium — the latter one of the most important branches in the work of the institution. There is just a moment to peep in at a substantial looking shed, specially built for the protection of puppies born at the Home. A magnificent St. Bernard is lying convalescent in the corner. Then, in another part of the yard, more kennels are visited, scrupulously clean, patterns of neatness; and one compartment in the far corner rivets our attention for a moment, for a blue enamelled plate bears the significant word " Dangerous." It would not be well at any time to attempt to cultivate the acquaintance of any of its inmates. The Home has every reason to be proud of its collies. It was a was a smooth-coated collie borrowed from the Home for Lost Dogs which figured so prominently in the last Military Tournament at the Agricultural Hall. The dog was borrowed for the purpose of testing the value of the German system of sending messages by these useful creatures during the progress of military operations in time of war. The dog was attached to a cyclist who rode the whole length of the hall—over bridges, ruts, and other difficulties in the way — the animal following him. Then the cyclist wrote a message, and tied it round the collie's neck. The way was pointed out to him, he took a silent view of the road before him, and then, with a sudden bark suggestive that he understood, away the collie went, and delivered the despatch safely as required. This dog is now the property of Major Crabb. We are now nearing what is, perhaps, the most important part of the Battersea Home, the Infirmary — which is practically the condemned cell — the lethal Chamber, and the Crematorium. The condemned cell is a huge kennel separated into two compartments, through the iron grating of which often as many as a hundred dogs are to be counted. It should be said that a dog is never put to death unless it is past all cure, and, further, that the means employed are as quick and humane as scientists have yet discovered. For many years the method of killing was by the administration of hy-drocyanic acid, but Dr. B. W. Richardson, F.R.S., conclusively proved that the most painless way of causing death was by the use of narcotic vapour, and he superintended the erection of an excellent Lethal Chamber, which was finished in May, 1884, and since then has been in constant use. It is possible to nar¬cotise as many as a hun¬dred dogs at one time. This generally takes place at night. The unfortunate animals are conveyed from the Condemned Cell to a large cage some ten feet long, by four feet in depth and width. Two such cages — each of which is divided into tiers — are here. When the dogs are safely secured in the cage, they are taken to the chamber, the door of which is unlocked, the bar-bolt lifted, and the cage with its inmates is run into the le¬thal apartment. Here it remains for some six or seven minutes, during which time the cham¬ber is charged with carbonic acid gas, and a spray of chloro¬form is pumped in, which the dogs immediately inhale. This pro¬cess of bringing about all that is needed is not strangulation or suffocation, but is essentially a death sleep. There are also two smaller chambers pre¬sented to the Home by Dr. Richardson, con¬structed on similar principles, intended for use when a dog has to be destroyed at once. Exactly opposite the lethal Chamber is the Crematorium. This is a while brick structure, with a chimney some 65 ft. high. It is so built that the bodies of the dogs do not in any way come in contact with the fuel ; the heat being obtained from the coke furnace below. The door of the Crematorium is wound up by the means of a windlass, and the interior reveals a space of about 10 ft. long by 9 ft. in width. After the lapse of some five or six hours from leaving the lethal Chamber, the animals are put in here. By the morning all that remains of them is a few charred bones, and in a corner of the yard may be seen a dozen or so of sacks, containing all that remains of many a domestic pet, waiting for the soap-makers (who buy them) to come and fetch them away. The number of dogs thus destroyed every week aver¬ages three hun¬dred. A very touch¬ing incident oc¬curred just where we are standing, only a few weeks before. A gentleman entered the gates of the Home, followed by as pure a specimen of a St. Bernard as could be wished for. He said quietly that he wanted it to be destroyed. The secretary looked at it. A valuable dog indeed ; a splendid creature. The owner knew it. No money would purchase it, but, unfortu¬nately, the dog had proved himself a bit snappish, and his master had only just paid a considerable sum of money as atonement for damage done. It was to be destroyed. The master left the dog, and said he would return in an hour’s time. He did so, and by this time the crea¬ture had been taken to the lethal Chamber, and there on a slab apparently asleep. It was hard for his master to believe that he was dead. The gentleman even felt the dog's heart to see if it was beating, but there was no sign of movement. Then he broke down ; the strong, stalwart fellow burst into tears as he talked to his favourite. He told the dead creature that they had been com¬panions for ten years, and he felt the part¬ing more than that of a brother. Again he went away, but the next day found him once more at the gates. He had had no sleep—could he see his dog again ? But it was too late. All that was left of the once envied St. Bernard was a few ashes,-and without a word the heart-broken master turned and left the place. One corner of the premises is particularly interesting, and we look in whilst passing. It is the cats' house. These are in many instances stray cats, picked up in West-end areas, and brought to Battersea by benevo¬lent ladies. They are fed twice a day. In the morning they get new milk, and a varied diet of the customary horse-flesh and fish. Many parcels of fish are sent as pre¬sents for the cats. The frolicsome pussies have decidedly comfortable quarters, and they, too, have a playground, in which are planted tree trunks, of which they freely avail themselves. One of the cats' houses is peculiarly noticeable. These are the boarders, for cats may be left here at a charge of 1s. 6d. per week. This little col¬lection in front of us is the property of a lady who has no fewer than a dozen here. All have their pet names, and she frequently comes to feed them herself. These splendid Persians and Angoras — the latter with a marvellous tail — have been residents here for some three years, and amongst them may be seen a fine specimen of a Russian cat with a wonderful head, which seems to while away its time by curling itself up in its own particular box or sleeping apartment ; and a bob-tail may also be found playing merrily.